We were delighted to be invited to telc’s offices in Frankfurt, Germany, to speak to Sean McDonald and Rebecca Rosenlund about their journey into on-screen testing, and the success of their recent pilot project. 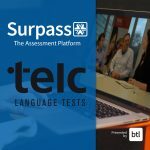 By re-thinking their existing content as opposed to simply transferring paper content to on-screen, telc have utilised the functionality in Surpass to create questions that test multiple skills at once, in a context relevant to how students learn and apply their skills today. Stakeholder research informed the development of new content, and just some of the examples telc demonstrate include questions which ask candidates to listen to instructions to find a location on a map, write a response to a text messaging chain, or watch a video tutorial and answer a series of questions that follow. Whilst paper testing may still be core to telc, their pilot project into digital testing has given them great insight into the opportunities this holds, and how assessments can more accurately reflect the ways students are living and learning. The assessments delivered by telc can be very high-stakes for candidates, in some cases determining whether they can remain in the country for work and study, so it was important to telc that they could test what the candidate can do, in a context they are familiar with. Reflecting on their existing processes, Sean and Rebecca also touch on the benefits of digital testing, including faster turnaround times, simpler logistics, and more flexibility over delivery. This discussion was an inspiring look at how telc took the opportunity to be truly innovative and try something new, enhancing the candidate experience and their processes. Watch the webinar in full to find out more about how telc have constructed these innovative item types, and how they have been received by students and colleagues.